Engineering Geology is an interdisciplinary field bringing together Geology and Geotechnical Engineering with the purpose of studying the environmental issues that may arise from the interaction between geomorphological processes and human activities. A deep knowledge about the site-specific geological and geotechnical characteristics is essential to locate, design and maintain engineering constructions. 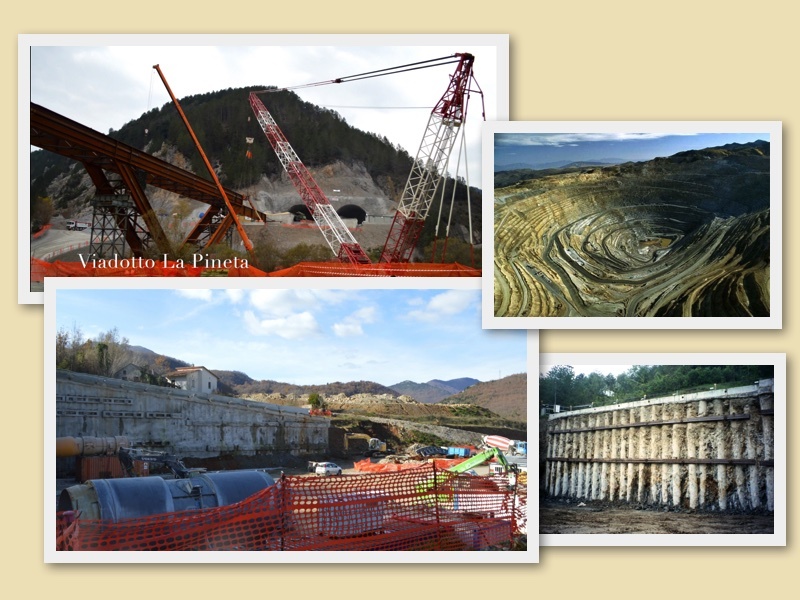 Geoscience helps also to preserve man-made structures from being damaged by landslides, erosion, flooding, subsidence, dewatering, earthquakes, and similar geological hazards. The main activities are the recognition and interpretation of natural processes, the understanding of how these processes impact human lives and man-made structures, and the identification of proper mitigation measures to prevent catastrophes. These challenging tasks are operated by the integration of field reconnaissance, terrestrial monitoring and remote sensing measurements. The reconstruction of 3D models is also useful to consider the delicate interplay between environment and man-made structures. We cooperate with public institutions and private companies to help them in site selection for critical infrastructures, such as landfills, waste repositories or plants for mitigating flood hazard. On the left-top: Construction of La Pineta viaduct for Italian highway (Salerno-Reggio Calabria). On the left-bottom: Construction of the Jannello tunnel for Italian highway (Salerno-Reggio Calabria). On the right-top: Example of mining site. On the right-bottom: Example of retaining wall for slope stability during building construction.